Our craftsman is a pioneer and innovator in the dog house construction business. Every component used in association with his unique custom dog houses are his own original innovations dating back to 1990. So desirable are his cat and dog house designs that inferior imitations are now appearing in the online marketplace today by envious competitors. Quite a compliment don't you think? Our craftsman is on the cutting edge of technology and design because he's an innovator not an imitator. He uses only natural unfinished, clear grain, solid premium and rustic Western red cedar wood for the exterior of these dog houses because it is a natural insulator, lasts decades, "does not" require painting and "does not" contain volatile finishing compounds that can cause allergic chemical reactions with your pet. On the contrary, Western red cedar possesses a natural woodland aroma which is calming and compatible with your pet and in sync with nature. Despite what competitors say to try and convince you to buy their dog houses over ours, our Western red cedar dog houses do not bleed out its naturally protective cedar oils as the "Aromatic red cedar" variety can. Some manufacturers build their dog houses with modern engineered wood which is simply a composite of layered scrap wood using excessive volatile adhesives containing formaldehyde for prolonged preservation purposes, but continuously release highly toxic emissions more prevalent in a small confined area. You get what you pay for from us. The highest grade of clear Western red cedar wood beveled siding is overlaid for strength, double nailed onto the smaller pet houses and triple nailed onto the larger dog houses. Some competitors use lower grade siding which can only be attached with screws to keep it from curling, and pressure from the screws make it susceptible to splitting and cracking over time. While others have tongue-and-groove exteriors that can eventually let rain seep in causing mold and mildew buildup inside the walls. In the solid dog house construction framework, only stainless steel hardware is used along with full dimensional spruce lumber with 2"x2" interior framing and angle braced joists which adds stability. Additionally the base of the doghouse is weighted construction so it won't blow over or get tipped over by your active dog. Other manufacturers eliminate these steps altogether so their walls and floors weaken from outdoor exposure and collapse. Some manufacturers produce a molded plastic dog house that stays icy cold in Winter and can literally bake your dog in Summer since it causes extreme interior overheating. Besides panting, dogs need relief from extreme heat conditions or they can quickly become dehydrated causing a life threatening situation for your pet. Our natural unfinished wood dog houses stay cool to the touch even in hot sun. They also provide under eave ventilation for better air circulation. Note: Unless a dog house air conditioner is installed it is highly recommended that you open, remove or tie back any cat dog house door during warm weather. Although WRC possesses inherently strong qualities, it would normally still rot out attracting termites and mold beginning the first year under continuous ground contact. Whereby our master craftsman has solved that problem by using a revolutionary, non toxic earth-friendly lifetime treated wood as the base beneath the cat dog houses. Other unfinished wood dog house manufacturers do not contend with this important detail, which means their pet houses will begin to self destruct within the first year. 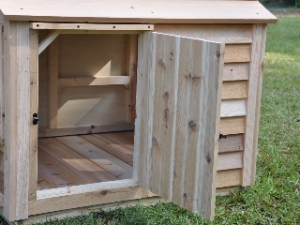 All of our pet houses feature a Western red cedar wood roof. (Beware plastic & asphalt shingles can cause interior overheating.) The pet house roofs are strong, "weighted" and designed for dual purpose. Both roof sides, and top center ridge cap can be optionally screwed down permanently into place otherwise, neither side or only one side can be screwed down while the other side with the ridge cap attached will rest snugly on top of its own framework. Thereby it can be easily lifted off/on at anytime without a tool. No floppy loosened hinges! This method works for topical access as in repeated dog house sweepings and undisturbed birthing observation. Our NEW side access doors are optional and very convenient for a quick cleaning out. He builds a reinforced raised tongue-n-groove solid red cedar wood floor. Other dog house builders on the market use thin, weak pine or pressed wood floors shipped in halves which can swell, sag, split or collapse under your dog's weight once assembled. We offer dog house insulation as an option saving you money if you don't want it or don't need it. Whereas we don't fool you into buying a higher priced pet house that already includes it. We offer a patented Seal Safe™ custom dog house door option to eliminate drafts and provide more efficient use of our climate controlled dog houses with a dog house air conditioner, a dog house heater or heated dog bed. We offer an optional Western red cedar custom built cat dog house foundation that is movable and provides a raised platform for your cat dog house and a relaxing dog deck for your pet to lounge on and place a water bowl. So you see, these important details can only come from years of experience in the pet house building industry and customer interaction. Therefore it is not unrealistic to say that our cat and dog house will last your pet's lifetime. Our cat dog house construction and packaging process is produced the old fashioned way one step at a time by hand, from cutting and assembling (no automatic machines) to packaging and shipping! Quality control is unsurpassed. Our master craftsman and cat dog house designer performs the final inspection on all products before leaving the facility. Look for his personal signature inside your cat dog house for verification and authenticity! Check out why our pet houses are Earth Friendly.